FOR BEST RESULTS rototill or spade the area to loosen compacted soil. Sod laid on compact, infertile soil will not be successful. Depending on the current components of your existing soil, fresh topsoil can be added. Your soil base should be 4”-6”. 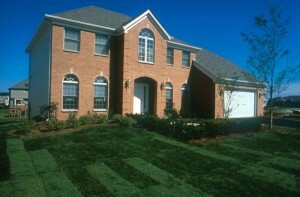 To ensure good drainage, grade soil to slope slightly away from the house or other buildings. Eliminate bumps or high spots where a mower might cut the grass too short, and fill in any low spots where rainwater tends to collect. Rake and smooth the soil, removing rocks, roots, and other debris. Roll the area lightly with a roller 1/3 full of water to firm the soil surface and remove air pockets. FIRST WATERING should be done as soon as possible after laying the sod, soaking the sod through the roll to a depth of one inch. Water once daily, or more often, keeping sod moist until it is firmly rooted (about 2 weeks). Then less frequent and deeper watering should begin. Watering bans do not apply to new sod. Water areas near buildings and driveways more frequently where reflected heat dries the sod. Avoid heavy use during the first three weeks to allow the roots an opportunity to firmly knit with the soil and to avoid depressions. Watering can be done any time of the day but the morning is the best due to lower evaporation rates. SOD IS A LIVING PLANT that requires ground contact and moisture to survive. If it is not possible to lay the sod the same day, stack the sod in shade or take off the first 2 layers to increase air circulation.